An increasing internationalization in the structure of research and academic institutions in the West has been accompanied by much greater visibility for Third World scholars in the ‘developed’ world. This book, comprising a blend of autobiography and intellectual history by some South Asia’s foremost contemporary historians and sociologists, shows that the postcolonial scholar’s presence in the West is a phenomenon worthy of analysis. 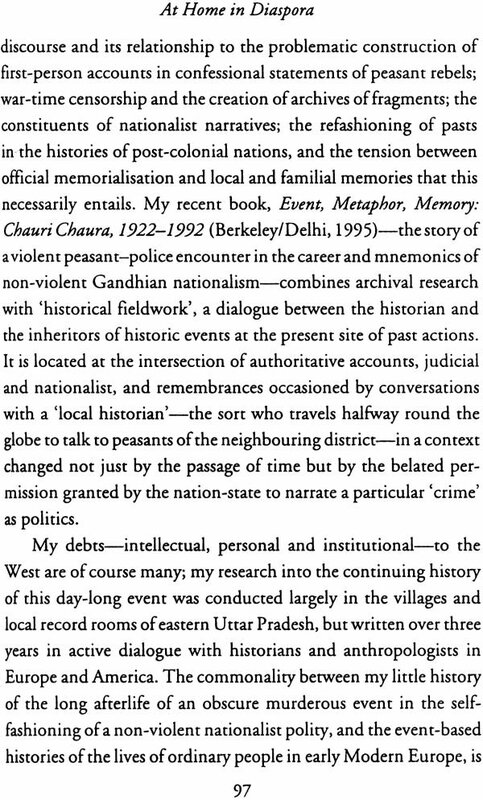 In particular, the questions asked here relate to the impact of the intellectual diaspora on research, both in the West and in South Asia. While showing how the intervention of scholars of South Asian descent in western academic institutions has reconstituted the debate on post colonialism, imperialism, globalisation, capitalism, and national traditions, this book is entertaining, informative, and thought-provoking about the whole history of South Asia’s scholarly transactions with the West. Some dichotomies have enjoyed as great a vogue in academic circles as in popular wisdom: those between ‘East’ and ‘West’, between Europe and Asia or Africa, between ‘the West’ and ‘the Rest’ – ‘North’ and ‘South’ as the current idiom currently has it. Yet our present insights, thanks to archaeologists, epigraphists, philologists, historians, and (more recently) anthropologists, can no longer afford us any excuse for believing in the historical existence of any such cultural complexes that supposedly confront each other eye to eye without any admixture or inter- mingling, like separate islands in an archipelago. Not only has the 'frontier' between 'the West' and 'the Rest' of the world always been a shifting one, but the images and ideas, the practices and discourses that were encompassed by these labels have differed profoundly over time and from one country to another, from one society to another. They have depended on regional and national, social and cultural belonging, as well as on a variety of standpoints adopted here and there by merchants, travellers, missionaries, soldiers, administrators, settlers and the various different strata of indigenous societies. There is no straightforward opposition between the so-called 'East' and 'West', but a hierarchical relation of multiple powers and modes of subordination that is more often than not a construct of Western ethnocentricity, inspired by the belief in a fundamental difference between distinct types of religions, races, humanities. Such differences have been linked to a geopolitical confrontation between unequally balanced powers that dates back long before the century of colonial conquest, and in which colonialism itself was a particular historical stage of development (and non-development). Contrary to Kipling's assertion, and that of so many others during the period of colonisation, 'East' and 'West' first met up with each other a very long time ago. This is not to say that the world is an unbroken landscape. Our purpose is not to suggest that there has been a continual and undifferentiated intermingling of these cartographic imaginaries: far from it. 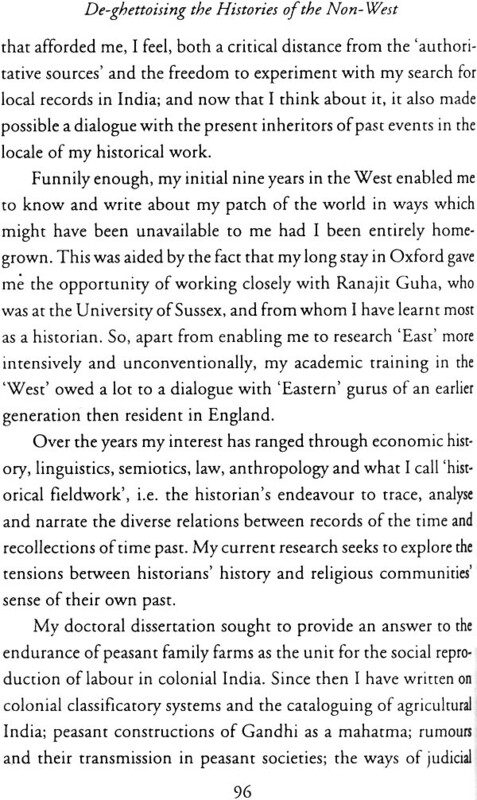 Varied scholars have sought to specify and demarcate with some precision the contours of these direct and indirect en- counters between 'the West' and 'the non-West', and such a field of enquiry has now become a sizeable trend in the academe. Studies by Francois Hartog, Anthony Pagden, Nathan Wachtel, Serge Gruzinski, Tzvetan Todorov, Steven Greenblatt, Marshall Sahlins, Fred Cooper, Greg Dening, Tom Holt, Nick Thomas, Michel- Rolph Trouillot, Ann Stoler, to name but a few, offer rich and imaginative, interrelated and overlapping attempts at making sense of the process of interaction and appropriation, acculturation and hybridisation, collaboration and resistance which resulted from encounters that took place in almost every conceivable epoch and region. These approaches can be subsumed under three rubrics: those mostly interested in the issue of 'representation', images and cross-gazes that various cultures manufacture of one another across space and time, whether synchronically or diachronically; those that deal with 'contact', the twilight zone where dialogues and ex- changes take place, and the ensuing multiple ways of accepting, misunderstanding and rejecting the Other. Lastly, those that ad- dress the issue of colonisation of imagination, body and mind, as well as of colonial cultures-material and non-material-in relation to the social fabric. These colonial cultures appear as specific producers of power and violence, the latter forces being at work in postcolonial societies even today, while assuming different forms through 'North-South' relations. These three approaches are by no means mutually exclusive. Rather, they may overlap with one another and/or feed on each other. Work inspired by them has significantly contributed to documenting earlier multiple processes of' globalisation'. As is well known, this kind of worldwide phenomenon is not a recent ones there have been several waves of globalisation (as well as’ de-globalisation’) in world history. From the sixteenth century onwards, each of these has been accompanied by particular type of exchange and migration, accommodation, narration, negotiation and resistance.